Before Michigan Road was a toll road, it was a public road, built with state backing. The road was completed in 1834, connecting Madison, a major Ohio River port, with Lake Michigan at Michigan City, Indiana. After the advent of railroads, many of these early routes were turned over to private toll road companies. A common practice was to let private companies collect tolls on roads they had improved, as was the case for the New Augusta Gravel Road Company, which had put gravel on parts of the Michigan Road north of Indianapolis. Samuel Howard was the toll keeper here for twenty-five years in the late 19th century. He and his wife served as toll collector, storekeeper, postmaster, and notary public for travelers and nearby farmers. 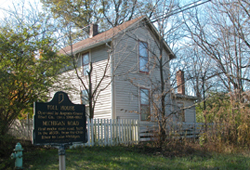 Michigan Road Tollhouse, 4702 North Michigan Rd., is a private residence not open to the public. It can be seen from Michigan Road.